On this page you'll find a compendium of bits and pieces that do not qualify as portfolio items, but may nevertheless be interesting in their own right. Some of these entries aren't web pages at all, but rather samples of the voice-over work that I've done as a radio announcer at Classical KFSD-AM (defunct as of February 2007) and KFSD-AM "The SPA." The entries are arranged roughly in descending chronological order. You can access each item either by clicking on its name, or on its associated image. XGB's Reviewer Profile on Amazon.com (January 2009 to the present). An assortment of reviews of jazz recordings and books in my own collection, some purchased from Amazon, some not. Yeah, I realize that just about anyone can contribute a review on Amazon, or CNET, or suchlike. But allow me to be clear about a couple of things. First, I do not flood my reviewer profile with hundreds upon hundreds of pithy two-line reviews. (To this point I have posted only twelve reviews in all.) Second, I do not migrate to someone else's computer just so I can fallaciously award myself dozens of "helpful reviewer" votes. Instead, I concentrate on reviewing items that I believe are significant, or that I believe buyers would do well to avoid. My reviews tend to be lengthier than the average and, it is hoped, invested with a considerable amount of thought. In the future I plan to branch out a bit, and review recordings of classical music as well as jazz. The SPA Datebook: Whale Watching (MP3 audio, 01:04, recorded January 2009). From the start of my employment at Astor Broadcast Group in 1998, one of my duties has been to write and record weekly public service announcements (known in the trade as "PSAs") for the various stations in the Astor consortium. Out of these arose the Community Events Calendar (on Classical KFSD-AM, and still on KCEO-AM—an online edition is assembled and published by me) and The SPA Datebook on the current KFSD-AM (here's the online edition, which I also publish). This one-minute announcement never passed muster as a PSA (it was too commercial for that), but I saved the file because I was rather enamored of the music bed that I chose for it. I like to choose my own music beds wherever possible, often from recordings in my own collection. This is a representative example; the music is excerpted from Somewhere in the Night, from Cal Tjader's album Soul Sauce (Verve 314 521 668-2). The SPA Datebook: Hatha Yoga (MP3 audio, 01:04, recorded June 2008). I have been profoundly skeptical about religion ever since I was a small child. Nevertheless, I maintain a deep and abiding respect for certain aspects of the Eastern traditions of Taoism, Buddhism, Hinduism, and Jainism, particularly the disciplines, or yogas, they impose on the mind and body. At the same time I remain deeply suspicious about the wave of trendy, very chi-chi "yoga bistros" that have sprung up in Los Angeles, San Diego, and other places in California in recent years. (Does the goal of one's spiritual awakening ever trump that of making money?) Therefore, when the time came to record this PSA announcing a series of classes in hatha yoga at a local community-college extension, I wanted to approach the task with some gentle, good-natured tongue-in-cheek. I owe my colleague and good friend Rick Roome for helping with the sound effects. The music: Dance of the Harlequins by Lalo Schifrin, from his album Esperanto, performed by the WDR Big Band Cologne with Schifrin conducting (Aleph Records 019). The SPA Datebook: Various Announcements (MP3 audio, 04:08, recorded April 2008). So...did you get all that? (;-}= (That's one reason why I lobbied hard to publish an online edition to supplement our radio announcements!) An amalgam of four PSAs (one 2:00, one :60, two :30s, respectively) using music sourced from original Tommy Dorsey recordings, to anonymous spacy world-music found on production CDs, to music by Alterations Garden, a local band in San Diego that assembled a pick-up group for this recording made around 2000. The flyer drew raves from SDFH, and from others spread as far and wide as Los Angeles and Riverside counties, and Arizona. We must have drawn dancers from those and other places in the U.S., because we enjoyed a record crowd of about 160 dancers, many dressed as astronauts and space aliens, packed into that smallish church hall. KFSD Listener Request Friday: The "Purple Prototype" (crea- ted April through June 2006). 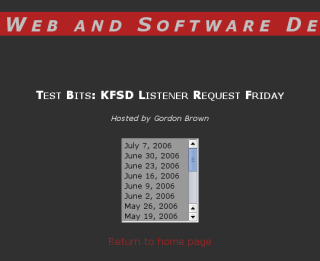 This project, whose development began within my first month of learning XHTML and CSS, stems from a radio show called Listener Request Friday, which I produced and hosted on Classical KFSD-AM from 1999 to 2007. I had always kept records of the selections that listeners requested each week, and I was intrigued by the possibilities of writing these records in markup format and displaying them online. This "Purple Prototype" is the result. 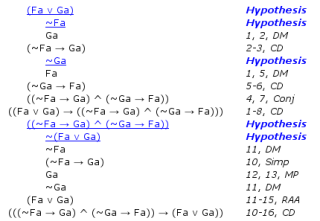 (A record of each program can be viewed by using the scrollable menu box on the gray main page.) When I began work on the prototype in April 2006 I had no idea that I would be creating my first "professional" website (for Classical KFSD-AM) just a couple of months later, or that this collection of "purple pages" would serve as the prototype for the Listener Request Friday page of the new website. Luckily, the prototype translated quickly and efficiently to the finished product, with only minor changes to both the XHTML markup and the stylesheet code. XGB's Radio Demo (MP3 audio, 03:42, recorded circa 2003). A demonstration disc that I had assembled as a résumé of my recent work in radio, with assistance by colleagues Rick Roome and Jeff Gallagher. At nearly four minutes it's a bit long for a demo, as most prospective employers tend to "tune out" after less than two minutes. The program Past, Tense! was originally conceived to air on 92.1 FM Premium Radio, an indie/alternative music station. Past, Tense! was designed to illustrate the premise that there really is nothing new about alternative music, that even the classical world has its own "alternative" branches. After Premium Radio dissolved due to sale of the 92.1 FM band to another corporation, Past, Tense! was reworked for inclusion in Classical KFSD-AM's program lineup, where perhaps it had a more fitting home. I produced roughly 30 to 35 of these programs, which championed the music of such composers as Igor Stravinsky, Arnold Schoenberg, Anton Webern, Alban Berg, Paul Hindemith, Edgard Varèse, Olivier Messiaen, Arthur Honegger, and the like—composers whose music is considered too far out to be aired on mainstream classical stations. (Occasionally, however, I would slip in music by contem- porary or "indie" musicians, such as Cantara by Dead Can Dance.) I still have these programs on minidiscs in a box somewhere in my home. The music you hear under the Past, Tense! promo (after the Vivaldi, of course) is the theme I selected for the program: the opening bars of Arthur Honegger's 20th-century symphonic masterpiece, Symphony No. 3, "Liturgique."